Magnesium is needed directly for over 350 biochemical processes within the body, and is additionally involved in thousands of others. Magnesium is vital for energy production, metabolism of other minerals, regulation of blood sugars, maintaining normal muscle and nerve function, and maintaining strength of bones and teeth. The majority of readily available horse feeds and forages are grown commercially with the help of fertilizers that contain little or no magnesium. Over time, soils become depleted of magnesium and some other minerals, which are then not available for uptake by the growing plants. The result is an over-abundance of minerals such as phosphorous and potassium and a deficit of magnesium. Some legume forages such as lucerne and clover are naturally high in calcium but will be low in magnesium if grown in magnesium deficient soils. High levels of calcium, phosphorous or potassium inhibit absorption of the small amount of magnesium that may be present in the forage. 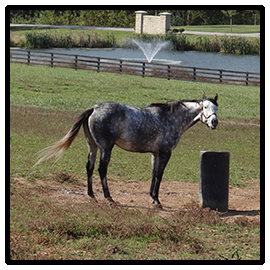 The ideal environment in which equines thrive includes vast areas of low-sugar native pastures on which to roam freely in the daily search for feed and water. The reality is that domestic horses are frequently kept in small paddocks or fields that were previously used for dairying and/or cattle production. These pastures were often ‘improved’ by the addition of imported grass species that can accumulate a very high sugar content, suitable for achieving high milk yields and rapid growth in cattle. 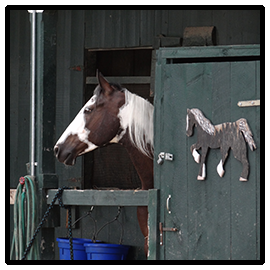 It has been well documented that the equine digestive system is not adapted to processing large amounts of sugar or non-structural carbohydrates (NSC). Horses grazing high NSC pastures become susceptible to blood sugar disorders such as insulin resistance, which can result in footsoreness or laminitis and poor hoof quality. High levels of blood glucose, from a diet high in sugar/NSC, increases the body’s need for magnesium but at the same time will cause magnesium to be excreted through the kidneys and urine, thus magnifying any existing dietary magnesium deficiency. Consequently many horses owners have been forced to remove their horses from all pasture, or at least have grazing limited to one or two hours per day. Some trainers have established a ‘track’ system where a narrow track around the perimeter of a paddock is fenced off, and most of the grass either killed or grazed down to virtually nothing. This has been an expensive and time-consuming solution as pasture must be replaced by hay. Very few domestic horses would consume enough magnesium from pasture or feeds to meet their daily needs, and have sufficient magnesium stored in body reserves to counter the amount lost each day. As well as a high consumption of sugar, stress of any kind will cause large amounts of magnesium to be excreted. This would include, for example, travel, changed living or herd environment, inappropriate training techniques, extremes of heat and cold, injury, pain, even the physical exertion of exercise. Lately, it has now been found that some horses are able to remain permanently on pasture with no restrictions to grazing, even those highly prone to laminitis. This has been achieved by feeding magnesium to those horses in sufficient amounts to counteract the effects of a high sugar intake. As magnesium is needed for such a wide range of body processes, deficiency signs can present in an equally wide range of ways. Ten horses living in the same paddock may show signs of magnesium deficiency in ten different ways, influenced by individual genetic traits that govern how much magnesium can be absorbed and how much is excreted.